On our last day in Kyoto we spent a few hours in Gion. Initially we had plans to explore Nara, but the weather was bad, it was cold and rainy and we did not want to venture too much outside. We wanted to stay close to coffee, tea and cheese cakes – which sounded like a good plan for the day, given that Gion has its fair share of coffee and tea houses. 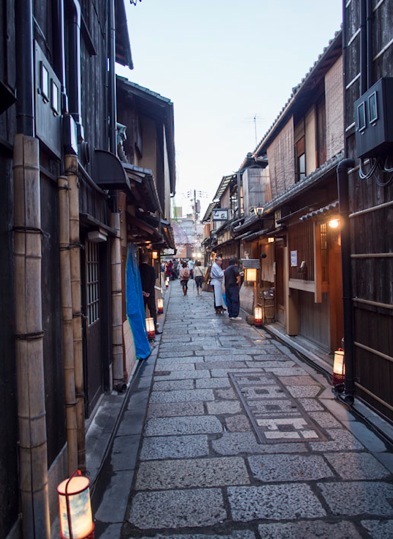 The Gion district of Kyoto is known for its many geisha houses and traditional tea houses. The district originally developed in the Middle Ages, in front of the Yasaka Shrine (which we had already visited earlier). 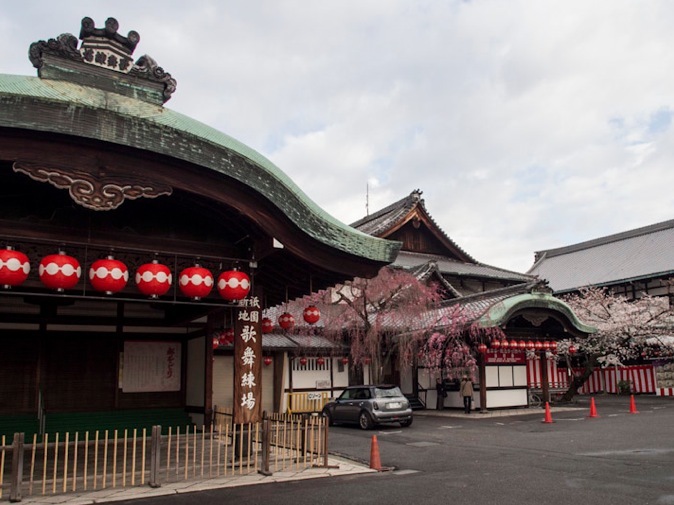 It was built to accommodate the needs of travelers and visitors to the shrine. It eventually evolved to become one of the most exclusive and well-known geisha districts in all of Japan. 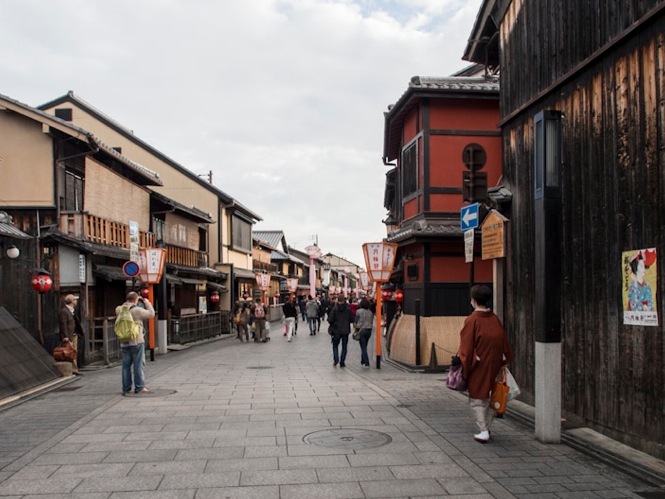 The area has a high concentration of traditional wooden machiya merchant houses. That’s because property taxes were formerly based upon street frontage so the houses were built with narrow facades only five to six meters wide, but extend up to twenty meters in from the street. We walked passed them until we reached Gion Corner, which is a traditional theatre, where Geisha perform for the public. We did not go inside, we just saw it from the outside and made our way back to the main street, where we found an old-style coffee shop selling strong coffee and amazing cheese cake. We had one piece and then another one. Geishas are entertainers, women of the art and in Kyoto you can see quite a few of them. The real geiko and maiko don’t normally come out until it is dark or almost dark, when they are on their way to entertain people during their dinner at one of the tea houses or restaurants in Gion. 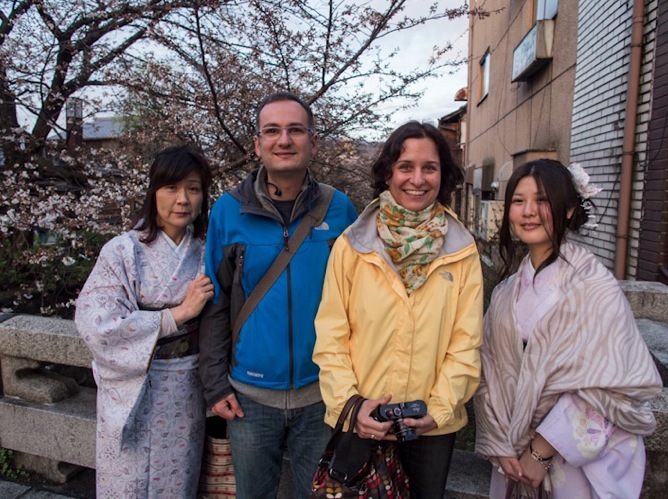 However, during daytime you can see quite a few geishas wandering the streets of Kyoto. 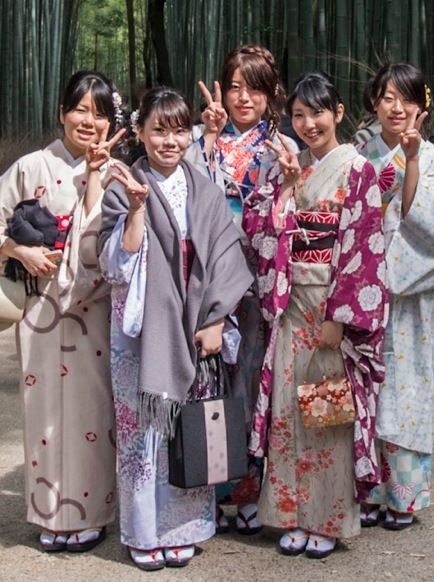 Chances are high that you are actually looking at a tourist, dressed up as a geisha (you can rent the wonderful clothes with make-up for a few hours). 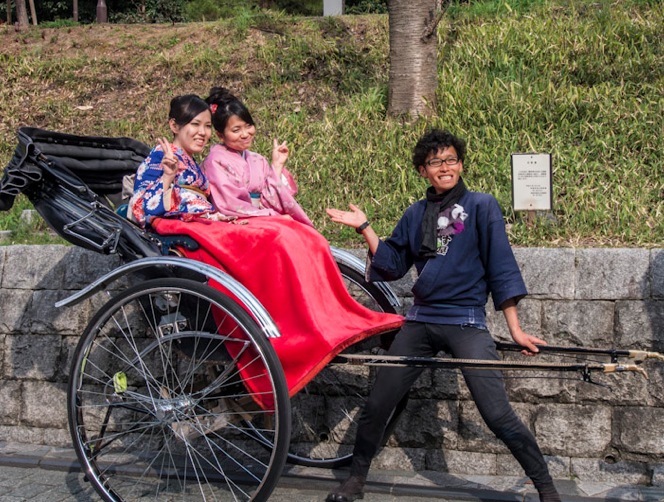 You can tell a geisha is a tourist when she stops and giggles at you, when you are trying to take a picture! 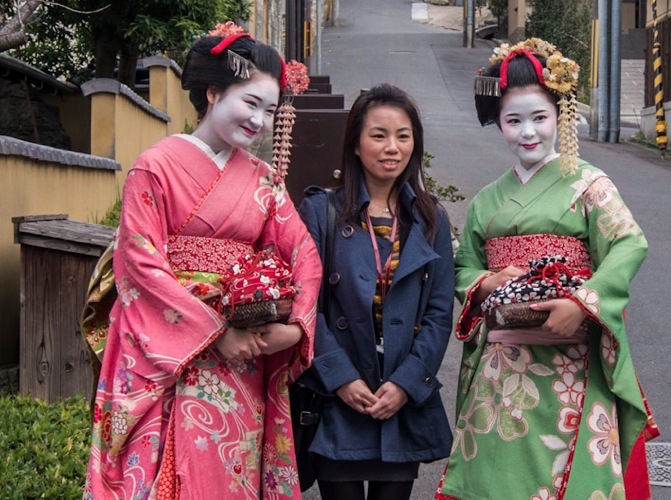 We saw quite a few geishas-for-one-day during our visit to the Kiyomizudera temple and the surrounding area. We even bumped into this nice pair, who are mother and daughter (both are tourists too). Their husband and father was taking a picture of them, Patrick was approaching him and asked if he could take a picture too and then the family insisted of taking the picture with us. That was very nice of them. We continued our stroll around Gion, but now it was already starting to become evening – the light of the day was slowly going away. We took a few more pictures of the quiet back streets of Gion and then started to look for a nice, simple yakitori place to have dinner.